Do you remember your first fishing trip? Your first deer hunt? Your first expedition into the wilds of northern Maine’s Big Woods country? How about the unique characters you’ve met, what you learned from them, and the adventures—and especially the misadventures—you experienced with them? Have you dreamed of greater outdoor challenges? My Naked Safari will rekindle those memories and inspire you to create new ones. 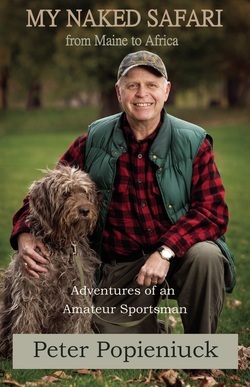 My Naked Safari is the chronicle of the author’s 60-plus-year journey across New England, Eastern Canada, and even South Africa, as an amateur, self-taught sportsman. At times, he was quite ill-equipped and unprepared for his adventures. In others, he shows how much his knowledge has grown. Many of the tales are filled with humor, some with excitement, and a few with sadness. All are true. Each will leave readers relating to similar people, places, and events in their own lives. Enjoy your journey! Peter (Pete) Popieniuck is a retired marketing communications manager who worked in the high-technology industry in his native New England. 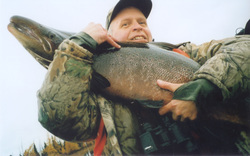 At an early age, Pete developed a deep affection for hunting, fishing, and other outdoor activities. He continues to enjoy these passions today. He lives in a log home in Lunenburg, Massachusetts, with his wife, Molly. This book is an excellent read, it made me laugh and it made me cry. I felt just like I was present on the fishing, camping, and hunting expeditions and having a great and entertaining time. I thoroughly enjoyed reading this. Peter's book is a funny, candid, sometimes touching account of his adventures (and misadventures). We have shared endless moments of successful and not so successful hunts with Peter Popieniuck. Cribbage games, trophies taken and missed, and above all else, the camaraderie that our relationship has provided have made for great memories. We are very proud to have played a small role in Pete's outdoor adventures and look forward to many more.